Frozen rice is your friend. I know it sounds surprising, being from the Philippines where freshly cooked rice is the meal standard but in bentoland, having ready cooked rice in the mornings is a big speed boost. And when you don’t have leftover rice from the night before, taking some from your frozen stash then nuking on high in the microwave works just as well. In this case, instead of simply freezing the rice, I added leftover chopped bistek tagalog, then molded the rice into onigiri triangle shapes then froze. Then, I simply peeled off the plastic wrap, microwaved on high, then rewrapped in plastic wrap for easier handling. To go with it, I fried some chicken nuggets and reheated some frozen peas, corn & carrots. As long as it’s something that won’t perish from freezing (like cream cheese) or microwaving (still cream cheese), it’s pretty safe mix with your rice to freeze as onigiri. The nice thing is, it also works as a quick filling snack since it’s rice plus other yummy tidbits. Other than bistek, I’ve also tried adobo flakes, tapa and SPAM and they all turned out yummy. If you were to make some, what would you add? Oooh the bistek looks yummy in your original post and seems like it would be equally tasty mixed with rice for the onigiri! I recently made and froze some onigiri mixed with salmon-flavored furikake, but haven’t had a chance to try them yet. The furikake on its own has quite a strong flavor so I think it will taste good diluted a bit by the rice. I also froze a quart-sized bag full of rice, unmolded, which shall have to be thawed and molded into fun onigiri shapes. Perhaps I will try mixing it with chopped bits of meat! You microwave the rice on High? How long? 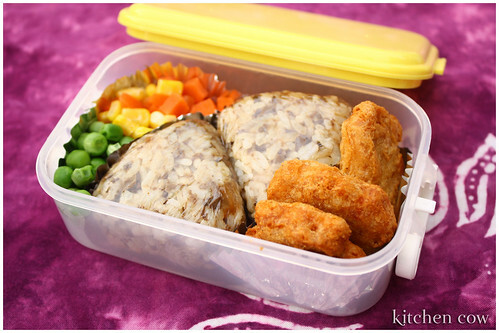 I love frozen rice, it saves me so much time when i just want a little bit of rice for a bento! For freezing and microwaving? Peas! Pre-frozen. I think crabsticks might also fare well. I haven’t tried freezing furikake because I worry about it getting ruined by the freezing and microwaving. Do let me know how it turns out, please? Glad you liked it. I fell in love with it upon that first taste too, so you can imagine me pestering my colleague for her recipe which she didn’t have! We ended up interviewing her, hehehe. I tried freezing the leftover sauce before mixing it with the rice and I don’t know if it’s with the coconut milk or it was because I waited too long before freezing but it was unpleasant. Have you tried freezing yours? How did it turn out? About the onigiri though, I’m pretty iffy because I think it’s too liquidy for onigiri. Might not hold its shape, but I’m just guessing. One to two minutes, depending on the quantity, on high. Straight from the freezer, no defrosting. This has onion bits <3 I was too lazy to pick out the onions from the bistek so I chopped them together. It's good nomnom. i wasn’t able to try it out at all! NO leftovers, NOTHING left to make onigiri with. it was supposed to be a part of the stash for the week.. it didn’t last 24 hours. i’ll try it next time… IF i manage to stop myself and the hubby from gobbling it all up. Again. What would I add? I always thought of asking Garandee to make a longganiza & tamago onigiri. The samurice line, right? The frozen ones? Sayang they stopped. Despite the sometimes mushy rice, I also loved the adobo ones. They’re selling onigiri again at selected branches, marketed as Ninja Balls. Only this time, they’re more like Japanese konbini onigiri, right down to fillings like wakame and mentaiko. I’ve been meaning to write about, I’ll try to write it sometime soon. There’s something about “Ninja Balls” that doesn’t sound right… but I’ll go check it out anyway. Thanks for the info! Well, it’s nothing fantastic but when I tried it, it was halfway decent. The filling was a bit dry, yes, though I wonder what it would taste like if it were fresh. Still, for a quick onigiri fix, I think it works. I’ve had better too, though. i did try adodo on my onigiri as well yum!